SharePoint out of the box auditing features is giving us very good functionalities for keeping track of opening or downloading documents, deleting or restoring items, editing users and permissions and many more, by default its turn off on top site collection level. The following screenshot shows that how we can configure audit settings from main top level site collection-> site settings-> configure audit settings. 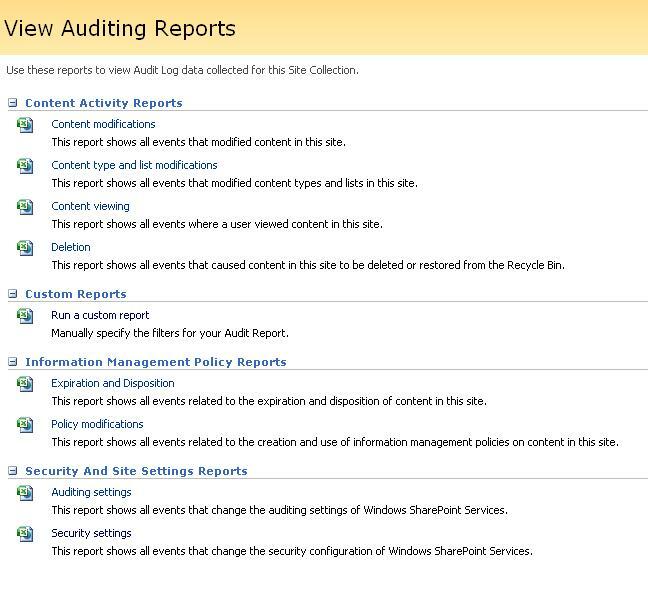 The following screenshot shows the various auditing reports available to administrators, who can view them through top-level site settings. When we clicked on any of the above reports, it will generate XML excel document which we can save to local disk or open for viewing purpose. 1. the generated XML excel document report don’t have user friendly data, like in “Event Data” column, it will display user id, group id instead of friendly user name and group name, it showing site collection GUID instead of Site Collection name and many more. 2. For viewing of auditing reports, user needs site collection administrator’s rights and user can see reports from going to top level site collection. 3. If we have large server farm with plenty of SharePoint sites under one site collection level, then at some point, we can have performance issue due to tracking all users’ requests for audit purpose. We can write custom code into visual studio and generate audit log reports as per our requirements. I have also searched on the internet for tool and web part to display and capture audit trail reports from SharePoint. Below are some good useful links which talks about how to configure auditing, viewing reports and how to write custom code for generating user friendly reports. http://msdn.microsoft.com/en-us/library/microsoft.sharepoint.spauditentry.aspx SPAuditEntry Class which will use for writing custom event data into audit report. 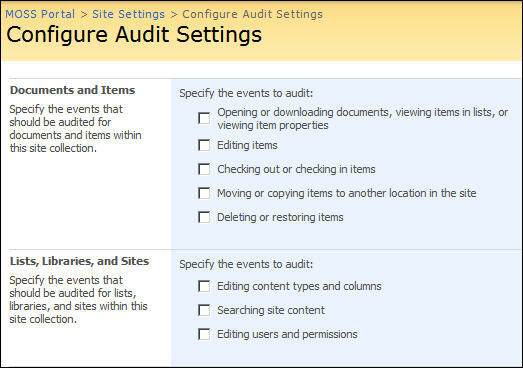 Great article, it explain step by step process to how configure SharePoint auditing and view audit reports. I found proficient application from https://www.netwrix.com/sharepoint_auditing.html which enables to to track site collection users/administrative activity and view of documents, document libraries, users, permissions, accesses, site, folders and generate sophisticated report on demand.